Weekend Kits Blog: Create Designer Albums with Easy Scrapbook Kits! Create Designer Albums with Easy Scrapbook Kits! Scrapbook kits make it easy to create designer albums with beautifully coordinated pages. We have 3 new designs to share with you today. These complete scrapbook kits, from Tapestry by C.R Gibson, include everything you need. They're an easy scrapbook kit for beginners or a quick weekend project for experienced scrapbookers. You'll find them in the Scrapbook & Card Kits section of the store! The Planted with Love Scrapbook Kit is the perfect album kit for capturing baby's special moments. 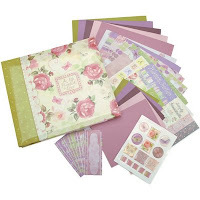 This baby scrapbook kit includes an 8" x 8" vintage-rose scrapbook album, ready to be filled with photos and memorabilia. It also contains the materials you need to create perfectly harmonized scrapbook pages, including an assortment of patterned papers, solid color papers, alphabet sticker sheet, phrase sticker sheet, journaling strips, photo mats, bubble stickers, and an idea sheet. Celebrate special friendships with the Friends are Like Flowers Scrapbook Kit. This is an ideal scrapbook kit for highlighting "fun-time" photos with best friends. Capture graduation ceremonies, birthday parties, summer camp memories, and more! It's easy & safe to attach your photos to your scrapbook pages using Scotch Photo Splits, archival safe mounting squares. They're double-sided and easy to use. The adhesive is "initially removable", so you'll be able to reposition your photos to find just the right spot on the page. The adhesive becomes permanent over time. 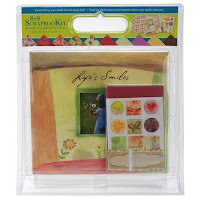 The Life's Smiles Scrapbook Kit is an all-occasion kit for capturing life's special occasions and moments. Scrapbook kits make it easy to create pages that match in color & design. All of the papers & stickers are pre-coordinated for you. Keepsake albums featuring photos of family & friends are a thoughtful handmade gift to give for birthdays, mother's day, or any day! 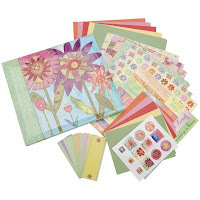 Visit the Scrapbook & Card Kits section for details on these kits and to see our complete selection of scrapbook album kits, mini book kits, page kits, and card kits. Weekend Kits offers creative craft kits, tools, and supplies - all in one store! Visit today and be ready to create a designer scrapbook album on your next Weekend at Home!